This recipe is a good example of how many Italian dishes combine bitter with sweet and savory flavors. Based on a classic and simple pasta dish, we’ve decided to substitute ground pork for the Italian Sausage. 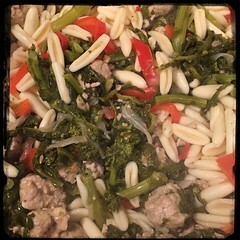 Cavatelli with Ground Pork and Rapini is a great way to introduce nutritious rapini* into your meals. Rapini is preferable but broccoli-rabe or even broccoli will do. 1. In a large bowl, combine ground pork, 1 tbsp olive oil, fennel seeds, salt, pepper and a pinch of garlic powder. 2. Hand mix and set aside. 1. Heat 2-3 tbsp olive oil in a large dutch oven over medium-low heat. Add minced garlic and onions slowly cook until color starts to brown (be careful not to burn the garlic, it will turn bitter). 2. Throw in small rough-meatballs of ground pork, cook until browned mixing occasionally. 3. Add red bell pepper slivers and cook for 5-10 minutes, stirring occasionally. 4. Add 1/2 cup of white wine and cook for 5-10 minutes, stirring occasionally. 5. Add the cup of chicken stock and cook for 5-10 minutes, stirring occasionally. 6. Add the Pecorino Romano cheese. 8. After the rapini has been cooking for 10-15 minutes add the lemon juice and let continue to cook for another 5-10 minutes. 9. Cooking the cavatelli (al dente). When the pasta is almost ready, take a ladle of the pasta water and add to the sauce, this will help the sauce meld into the pasta. Then, add the pasta to the sauce, mixing well. 10. Add salt and pepper (to taste). 11. While plating, sprinkle the ricotta salata on top with fresh chopped flat-leaf parsley.